Here is the monthly update with a few added photos. Please pass this on to whomever you feel should recieve it. Summer has really arrived and in true Taiwanese style with hot hot mornings and afternoons with a few thunderstorms thrown in here and there. As people are preparing for their summer vacations in June, we’ve found it to be a quiet month for visitors and adoptions. 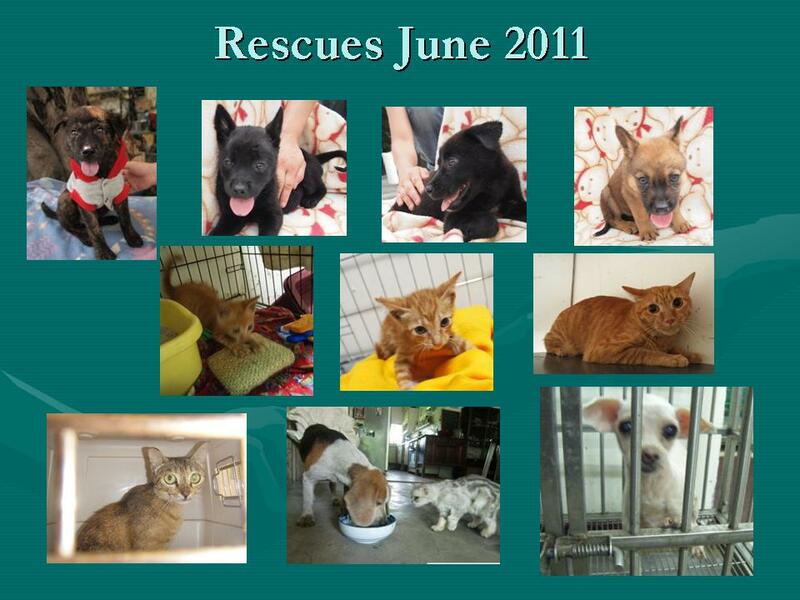 However, our rescues haven’t slowed down. We’d also like to remind you that the Animals Taiwan WAD Gala Ball is in full swing and tickets are going fast. If you would like to attend this great night on September 30th please email mayumi@animalstaiwan.org for more details on how to get your tickets. While out doing CNR in the Hsin Tien mountains, little Melody decided to come and see what was going on. She meowed and followed the volunteer, so the volunteer decided the mountain life wasn’t for her. She picked her up and sent her off to the clinic with the other dogs she caught that day. But Melody wasn’t put back, she has been taken to the centre and is looking for that loving home. Bilbo the Beagle was found wandering the streets. He was in a bad way with very long nails, infected eyes and a bad skin condition. He had no energy and was malnourished. He was taken into a foster home and found to be the perfect gentleman. He’s well behaved and gets along with cats and dogs alike. He rarely barks and is recovering well. On first looks he was thought to be an old boy, but on further investigation he is only about 3 years old. He’ll stay in foster care until he is adopted. YaTou a female Maltese was rescued from the streets by an AT volunteer after seeing her wandering round with matted fur. She was sent immediately to the groomers where she was finally freed of her matted and painful fur. She also had an eye infection and a bad skin problem from the matting. She is recovering well and will be coming to the centre for adoption. This little lady, only 3 kg, is a survivor and we’ll do everything we can to find her that loving home. Ningbaou is another cat that wandering into an area where a volunteer was doing CNR. He is also very affectionate and loving so we want to give him the chance to be in a loving home. Animals Taiwan was asked to investigate a kitten stuck in a tree! So off we went. We found little Sunny trying to hide her head in a hole in a tree, you know the "I can't see you so you can't see me" trick. We gently took her out and found that she was in good condition, just a little scared. She'll be staying in the center and looking for a home. Jackbean was rescued from the streets with serious dehydration and malnourished. He was basically skin and bone. He’s been under treatment and now he’s much better and more active. He loves attention and won’t let you walk by him without a little scratching of his head. He is at the center looking for a new home. 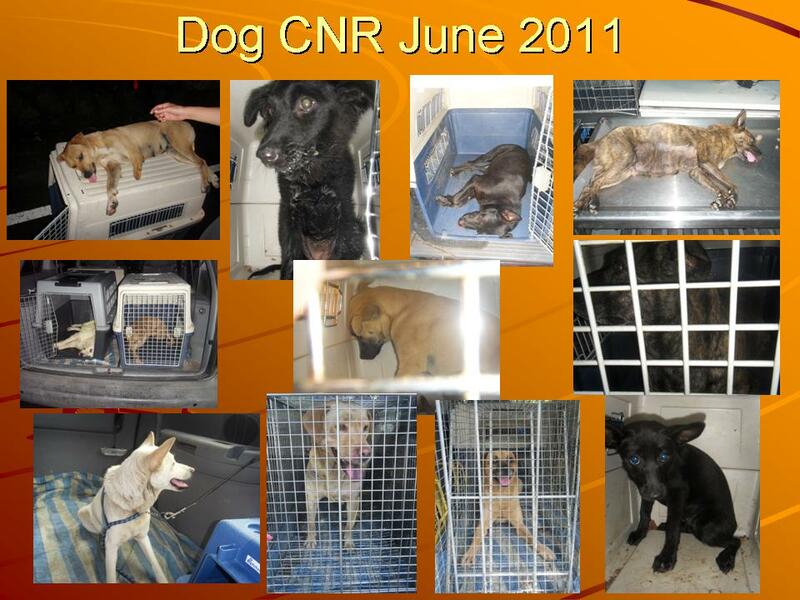 4 puppies ( North, South, East and West) were rescued from the HsinTien mountains. They all had a skin problem due to bad immune systems. However, after some good food and medical treatment they have recovered well. A couple of them are a little shy but the others are bouncy little puppies who just want to be loved. They are at the centre waiting for their forever homes. Rocky the Golden Retriever was found abandoned on the street. An AT friend found her and is fostering her. She is well behaved and very quiet. She is also looking for a loving new home. A mother dog was brought into a vet just about to labor. However, the mother didn’t survive. She had 4 bouncing Husky mixed puppies though and the vet couldn’t turn them away so raised them all by hand. AT is helping the vet to find loving homes for these 4 bundles of joy. 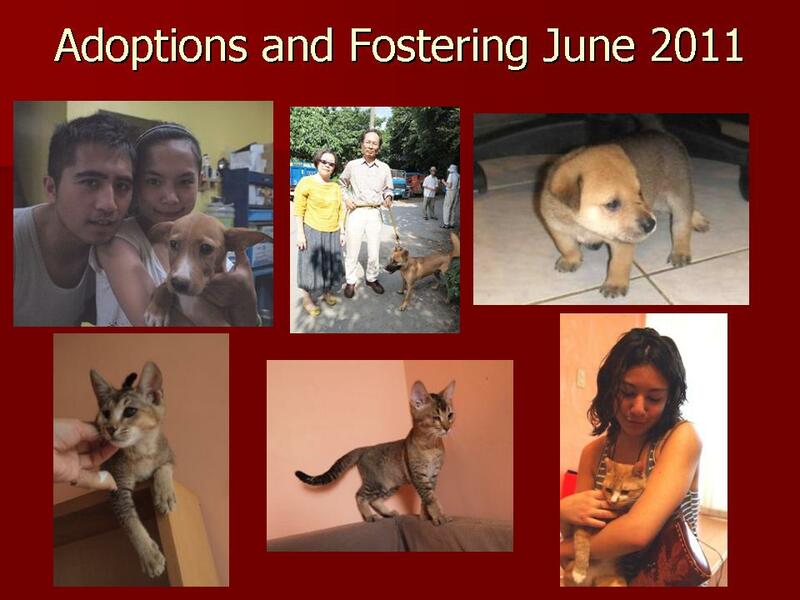 Since April AT along with volunteers and Aixin mamas have completed over 230 TNR cats successfully. This program is on going and we’ll continue to update you on our progress. We have also been working hard on the dog CNR in Hsin Tien. We are working closely with 3 different feeding ladies and in June we were able to catch, neuter and return 12 dogs and 2 cats. Of the 12 dogs 11 were females. All are doing well and the feeding ladies are keeping an eye on them. 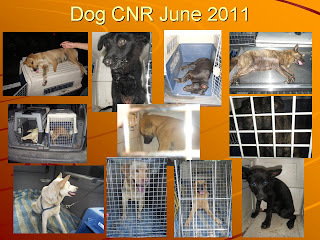 We are continuing with CNR in this area until 100% of the dogs have been spayed and neutered. 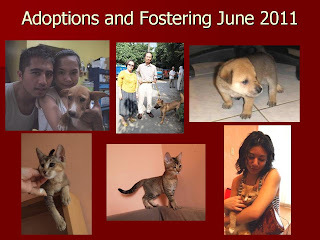 As we said it has been a bit of slow month for adoptions, but we are pleased that the few we have gotten adopted have gone to fantastic homes. Oliver, the orphaned puppy, is now in a loving home with a big brother. He’s loving his daily mountain walks and is getting lots of love and attention. Koala has finally been adopted into the perfect home. The couple were looking for a guard dog who would bark and alert them to intruders, now this is what Koala is good at. He’s loving his new home and the freedom to bark. Peanut has gone on his second tryout, we have our fingers crossed that this time will be forever. Pumpkin the mommy of previous kittens has found her very own loving home and is living the life of luxury. We are very grateful for out foster mommies and daddies, without them many of our animals would not be adopted as they would not have adapted so well to family life. Mei Mei the Persian cat has gone into an experienced cat home so she can become more socialized and friendly. Also Helen and Keller have gone into a foster home together until they are adopted. Dahuahua ‘s foster mom is unable to take care of Dahuhua anymore. However, her friend found another cat Peanut who is friendly and loving and would be easier to adopt. So we’ve done a swap for the time being. Peanut has come to our centre and Dahuhua has gone to a new foster home. And finally some sad news. Long John one of our long residence at Animals Taiwan was put to sleep. He has been fighting a brave battle with kidney failure for many years now and although the vets have said he was a miracle dog, we knew it was finally time to let Long John rest. He has left a large hole in all our hearts and will never be forgotten. He always had a wagging tail and kisses for everyone who came to the centre. He will be missed, but we know he is now in doggie heaven roping around without any pain. R.I.P Long John you have inspired us all.